RENA offers you the possibility to outsource the assembly of your luminaire assembly, including supply chain management as a service. Our manufacturing process is organised to be flexible and meet the needs of our (ODM-)customers, while we aim for a long-term partnership. In practise it means we will support you during your fixture development to arrive at the most economical construction to assemble your product. From first mock-ups to prototyping and testing. And from 0-series production for fairs and certification to volume production. 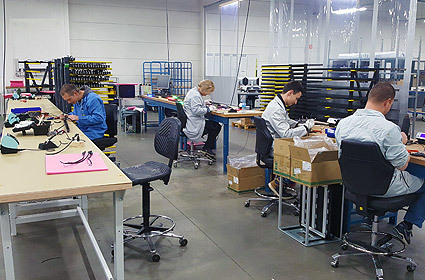 Together we decide if we use our existing, flexible assembly set-up or whether we go for customized equipment and an assembly process that fits your specific requirements. Our assembly lines can be operated in shifts, to enable flexibility during seasonal or project based peak demands. Our supply chain management includes the purchasing of components and the maintenance of supplier relationships. At inbound we will inspect the incoming goods according to your quality demands and take care of proper stockage. You can tune your forecast with our planning department to ensure timely manufacturing and delivery of the final product, in line with the dynamic demand of your customer. Contact us and let us show what we can do for you. This video gives an impression of our corporate culture.